RAW has space. Lightroom has attitude. …and together, those two mean you need to do something sometimes. …it only begins to look overexposed when I move “Highlights” to +30! While on the back of the camera it looks much more overexposed. A RAW image has a lot more space than a JPG. And what you see on the back of the camera is the built-in JPG preview that every RAW file contains. In addition to this, Lightroom “protects” us. If you blow out a background, for example, Lightroom pulls back the brightness to make that background NOT overexposed, as long is there is any room at all in the RAW file. So combining these: unless you make it really extreme, when you see blinking on your camera, you will get an image without overexposure on your computer. If you are “overexposing” by a stop on the camera, you will not even notice that on the computer. That is all very well, unless you want to overexpose. Like in the case of a background that you want to have pure white. Lightroom thinks it knows bette rthan you do, and that, in my opinion, is not a good thing. Fortunately you can fix it by the method I describe above, or by using the earlier 2010 Camera Calibration process (bottom right panel in the DEVELOP module). Just so you know. This is one of the things we will talk about at my Lightroom/Computer seminar this Saturday. There is still space: Sign up soon if you are interested: space is strictly limited. Lightroom helps in both cases. The “quick” is addressed by the following process. First, you rate all images to a standard, say 3 stars, namely the standard that most of your pictures will be; and now you only mark the exceptions. That takes half the work away. And to actually mark those exceptions, you simply use the number keys on your keyboard (“1” for one star, “2” for two stars, and so on) combined with right arrow (“next”) and left arrow (“previous”) in the negative strip. This only works, as said, if your system is clear. A system that needs you to indicate “how much you like an image” will not work: it has to be more objective. One star: this image is technically bad; too bad to fix in post-production editing. It is out of focus, or too under= or overexposed, say. Two stars: this is technically OK, but it is not an inspiring image. A snapshot. Something you’d rather not use of you do not have to. Three stars: this is an image that meets my standard; i.e. one that I would be willing to share with a customer. (That does not mean I will share it). Four stars: this is one of the best shots in this shoot. Five stars: this is a portfolio shot. Note that the ratings indicate the end status; i.e. after editing, not the way it looks now. Your system may be different, but be sure that like me, you design a system that is simple and objective in the sense that it is not open to interpretation. 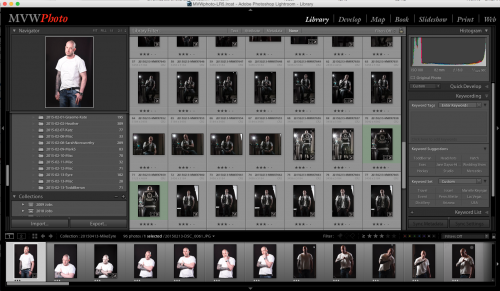 As a result of the system described here, I can rate a shoot in a few minutes, even when I have hundreds of images. Your workflow needs to be exactly that: a flow. A logical sequence of actions. “Asset Manage” them: add keywords; rate them 1-5; backup. Then from the ones marked 3 and over, pick the ones to actually use. Mark the edited ones as finished. Select the finished ones and output them for use. So it is basically “input – handle – select – edit – use”. And whether you are a pro or an amateur, it is going to be the same flow for you. And that flow is where you need to save time: you do not want to spend an hour making photos, followed by two hours in Photoshop. That is where Lightroom comes in. 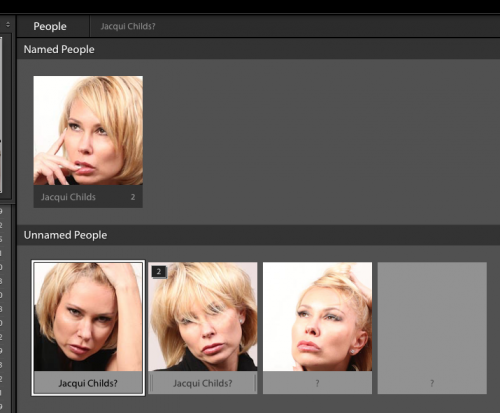 Lightroom is a one-stop workflow tool. It handles all the steps above: ingestion—asset management—editing—using. And it does it in an amazingly efficient way. Evidently, if you can save time in Lightroom, it saves time overall. And that is where Wacom comes in. I now also use a Wacom Intuos tablet, which I find very useful; much more useful than I would have imagined. Part of the reason is better quality than the last time I looked, years ago. And part is new functionality. Like customizable buttons per app. 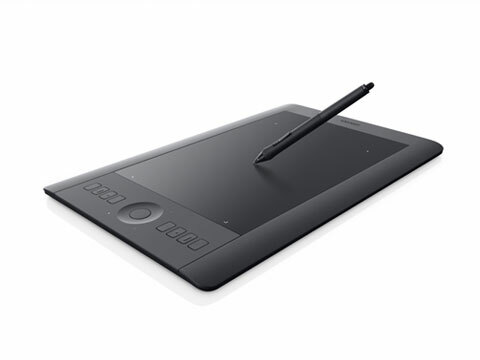 This tablet is especially useful when editing, and especially because of its pressure sensitivity. When using the brush, the harder I press, the more brush effect I get. Very cool. Skin fixes and other local edits are now much quicker—and that saves me a lot of time. This functionality is simply not available on a mouse. In the next weeks I will keep you up to date as to how I am using the Wacom tablet. I will start with customizing the buttons: how do I do it? What functions are most useful? As I sort it out, I will give you my recommendations. Stay tuned. Yesss… Lightroom 6 is out. And that is a reason to rejoice. After a complicated upgrade (I had real trouble finding the “buy it as an app” option: Adobe really wants the extra revenue of the Creative Cloud, so it pushes you there), and after a subsequent day of converting catalogs (my one catalog contains a quarter of a million photos) I am playing with it now. First, the feature you do not see: speed. Reports talk of a significant speed increase. I have not seen a giant difference, but based on reports, I am sure I will. It sure is not slower. Faster is good. 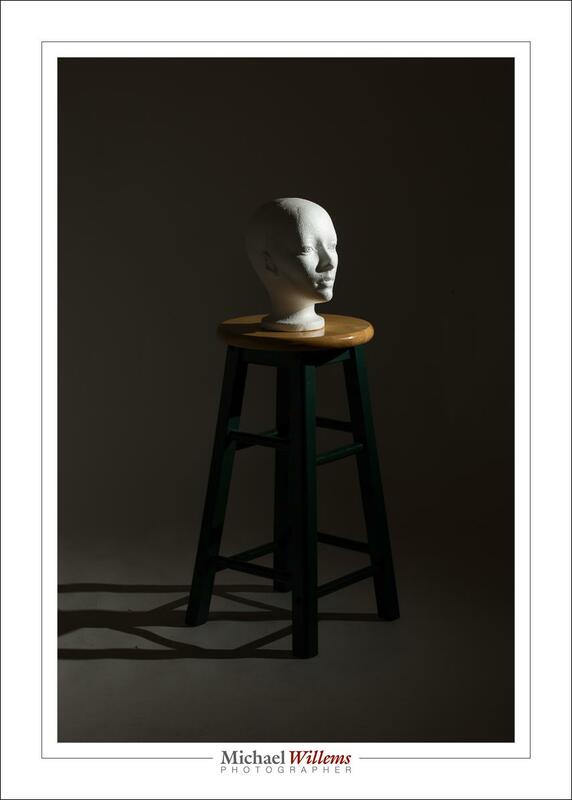 Second, the one feature that was cool in iPhoto (now: photos): face recognition. It has now been added to Lightroom, and it works well. The feature is intuitive: I have not had to read any sort of manual, so far. Lightroom recognizes where faces are in your pictures, and it guesses who they are with an amazing degree of accuracy. You start it; it identifies faces; you conform its guesses or correct it and name the people, and you are done. I did 2015, and am now am doing the preceding years. It will take me a while, but it’ll be well worth it. 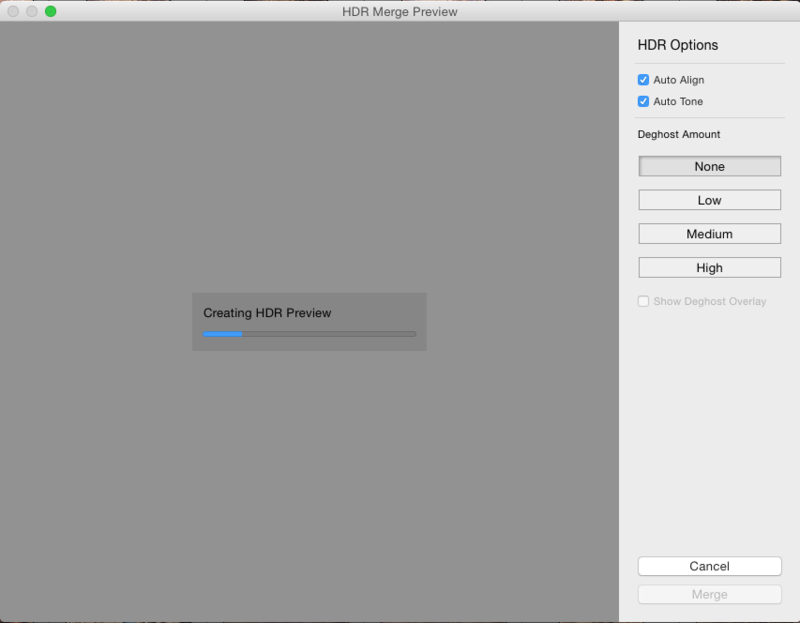 Another new feature: HDR, “high dynamic range”. You are now able to take a photo multiple times (2, 3, 10, whatever) with varying exposure, and pull them together into one HDR image. Gone are the days that dynamic range was something to worry about. Select the various photos, do some settings, like deghosting (see below), and you are done. 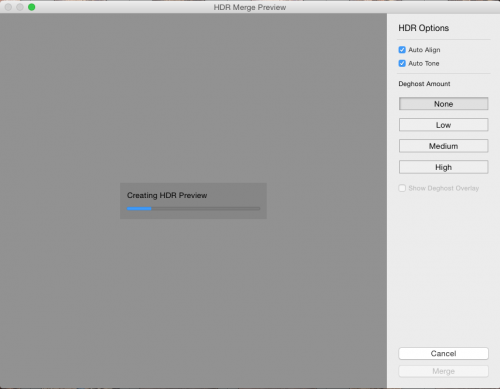 Lightroom creates a new images named …-HDR.dng: a full DNG. Finally, a good use for the DNG format. And much better than creating a JPG. Yes: 25,000 x 3412 pixels. That is, an 85 Megapixel DNG file. Wow! Fantastic, no? I will be doing this all the time now. I see all sorts of other advantages and incremental improvements in version 6. Let me give you just one cool little timesaver. To use the entire dynamic range of your image, take a grey, low contrast image, where the bottom end of the histogram does not reach “0” (the left end) and the top end does not reach 255 (the right end) (i.e. the blacks are not black and the whites are not white). Now, in DEVELOP, in the BASIC module, shift-doubleclick on the words “Whites” and “Blacks”. Lightroom automatically drags blacks down and whites up until you are using the full dynamic range from 0 to 255. Cool, or what! In the next little while I will document some more of these advantages and tricks, but for now, let this be enough reason already to upgrade. Enough reason by far. Have fun! I teach Lightroom, among other favourite things I teach. And that means I see many students’ computers. And often, I see less than I expect. Often, options, important options, are missing. See it there, between the grid and the negative strip? Now your toolbar will have all the tools. Check them out, then disable the ones you are sure you will not use. Another option that is often missing is also a very handy one: the filter bar. At the top. You toggle that one by first being in the LIBRARY module (press “G” to go directly to the Grid view, for instance), and then pressing “\” (the backslash key). (NOTE: In the DEVELOP module, the backslash key \ has a different, but also very useful function: it shows you the “before” view of a picture. In other words, the picture as it was when you imported it, or when you made the virtual copy. The image at the start of its edit history, in other words). There are many, many other cool little tools in Lightroom. You do not need to use all of them, but I recommend that you use the ones you like; the ones that are good for your way of working. And there is one simple way to learn them: just check out all the menus and try every function. Learn them. Yes, you can! First, I teach Lightroom, and I will help you set up your Lightroom installation: file structure, import methods, backups, disks, and more. Worth every moment of the session I assure you. Second, Lightroom only takes a few days to learn and is 100% worth your time and effort. Learn it. And as a supplement to my teaching and consulting, also watch my tips videos: see www.youtube.com/user/cameratraining/videos. Third: just saying: if the subjects interest you, then my e-books (see http://learning.photography) are worth your money also. As is my teaching (see the same site).